I have a spooky tale for you today, straight from my own backyard! Brown Mountain, which is found in the county next to ours in the Blue Ridge Mountains, has long been the home of ghostly lights. Called the "Brown Mountain Lights," these mysterious glowing lights - most prevalent in September, October, and November - have been the source of government and private investigations, news reports, folklore, and music, television, and film. The first documented sighting took place on September 24, 1913, as reported in the Charlotte Daily Observer, but anecdotal accounts and oral history predate this report by many years. * Faculty and students from Appalachia State University maintain this website about the Brown Mountain Lights. * This YouTube clip includes footage from Charlotte TV and National Geographic TV of and about the lights. * This YouTube clip includes footage of the lights shot with night vision for the National Geographic TV program Paranatural. * The X-Files episode "Field Trip" has Mulder and Scully investigating the case of missing hikers who were found dead in the vicinity of Brown Mountain. Mulder, of course, immediately makes the connection to the Brown Mountain Lights. ETA: The two-part story "Night Lights" by John Rozum in issues 18 and 19 of The X-Files comics is also about the Brown Mountain Lights. * ETA: travels_in_time pointed out that the 1968 novel Escape to Witch Mountain by Alexander H. Key (which has inspired several movie adaptations) mentions the Blue Ridge Mountains specifically and tells of mysterious lights and music coming from a particular mountain. 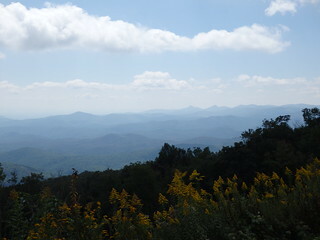 Further research confirms that Key did, in fact, base Witch Mountain on Brown Mountain! How cool is that? * The 2014 film Alien Abduction - which is very much worth watching if you like such movies - credits aliens with the lights. It was filmed in and around this area. Here's a Dread Central interview with director Matty Beckerman, who claims to have seen the lights himself. Oooh! Sounds like the excellent book "Escape to Witch Mountain" by Alexander H. Key (not the reasonable-ish 70s Disney movie, not the in-name-only 1995 movie, and certainly not the awful 2009 movie starring The Rock). The lights and the music that come from the mountain are never explained--well, they are, but only in the broadest of terms--which is slightly disappointing, but works to give a sense that there is a whole area of mystery there that most of us aren't privy to. Oh WOW - I hadn't made this connection at all, but now that you say it, I can see it! I'm sorry to say I've never read the book (though it sounds like I really need to do so), but I did see the '70s Disney movie when I was little, and I really enjoyed it. It stuck in my mind. I'm so tickled to hear that the book mentions the Blue Ridge Mountains specifically. Thank you for connecting the dots! This is such a fascinating (and cool) link! PS. I just looked up Alexander Key and the Brown Mountain Lights, and several sources argue that he intentionally made Brown Mountain the original "Witch Mountain." This is so cool! Thanks again for pointing this out to me. This makes my day! Now that I'm back home, I'm going to do some reading up on it! Nobody in my family had TV or went to movies when I was a kid, so the first movie I ever saw was this one, in a library, when I was six years old. I came upstairs in a complete daze and tried to tell my mom ALLLLLLL about it, and of course made no sense at all. I found the book a couple of years later, and spent the next several years hoping that some other library or school would show that film. I bought it on DVD the moment it came out. :D I definitely think the story was instrumental in the development of my deep interest in fantasy/sci-fi. I'll have you know that, thanks to you, I got and read the novel over the last few days. I loved it! And I can totally see how this would spark a lifelong love of SF/F. Father O'Day rocks. I may have punched my fist into the air in triumph with this: "Do you think the Lord on high is so frail that this little planet, with it's greedy little people, is all that He can do? Bah!... Go tell the rest of your kind there are marvels in Creation far beyond their narrow dreaming." Awesome! It was also great fun seeing local names (like Winston-Salem) show up in the text. :) Thank you again for making this connection for me and inspiring me to get to know the story better. Charles Fort approves this post! Brilliant! :D I'm doing the Fortean dance now! So, uh... will Dr. Amy be investigating then?? 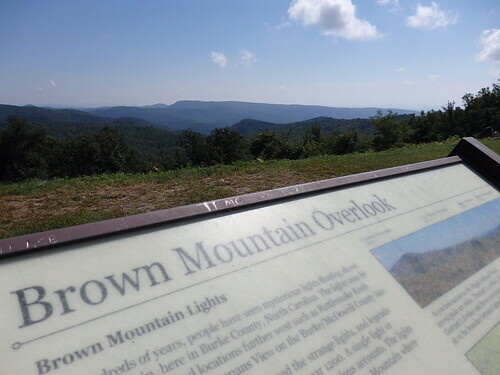 The Brown Mountain lights sound intriguing. I just have to tell you that I love your icon! I have that on a shirt! Yes! The more we hear about them, the more fascinated we are. I wrote a different story about the Brown Mountain lights for The X-Files comic book series. It was under the title "Night Lights" and was in issues # 18 and #19 for anyone interested in checking it out. Fantastic! I must read these now. Thanks so much for the heads up!